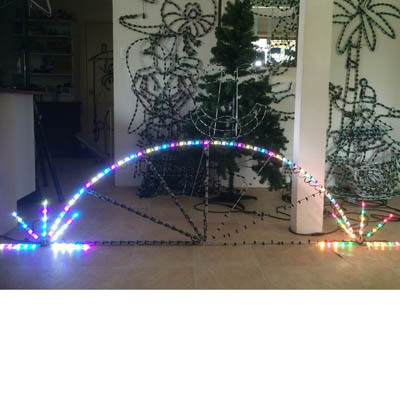 The Pixel Arch/Light Fan - the first of its kind - RGB Pixel/Node display element perfect for any holiday display installation. Made from aluminium, our lightweight Pixel Arch doubles as TWO LIGHTS. On the outside is our Leaping Arch and on the inside you will find the Pixel Light Fan. This Silhouette is perfect for business or residential display. We are happy to be the first and only retailer of these items. These arches & fans are perfect for adding RGB pixels and nodes for full color lighting leaps and stunning lighting effects. With pixels, now you have complete control over every single pixel or the entire lighting element as is. Never before has a wireframe been so visually entertaining on the eyes. The Pixel Arch/Light Fan comes complete with a bracing stand so you can secure into the ground. It is designed so when not in use it can be folded and stored as a flat pack.